Pauline Cushman, said P. T. Barnum, was the "greatest heroine of the age." An early biographer, Ferdinand Sarmiento, wrote, "The deeds of the Scout of the Cumberland will live as long as American hearts beat." 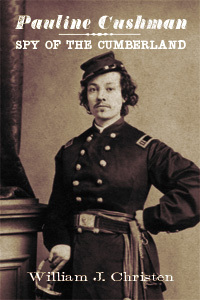 She was, according to historian Elizabeth Leonard, one of the “five women who became best known both during and after the Civil War” as spies. Yet, for all her renown, Cushman’s life story has remained a blend of fact and legend—until now. In contemporary descriptions, she was “the Heroine of the People” who combined “all the daring of the soldier with the tenderness and modesty of the woman.” By the early twentieth century, she became the stuff of fiction, both in the movies and, later, television. In the late twentieth century, some historians told a darker story, hinting at alcoholism and drug abuse.